I was filling my new bookshelf a few weeks ago and, as what always happens, I start wasting time by leafing through a book I hadn’t looked at in a while. In this case it was Brian Taylor’s Rustboy: Re-animating a Lifelong Dream. 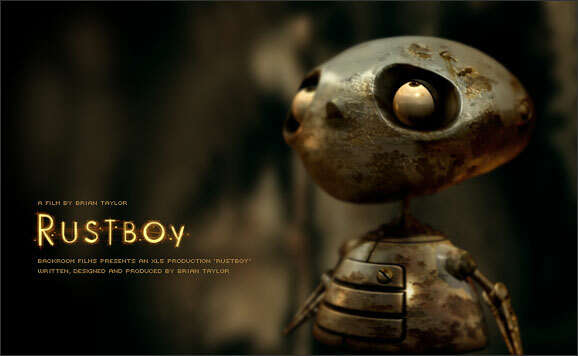 Brian had started his Rustboy short film project some years ago (ten maybe? ), and created beautiful looking animation with what was the available software of the day, all on his own. He published his progress on a slick website where he featured preliminary drawings, storyboards, test animations, and even specially composed music. It naturally garnered him quite a lot of attention. Though the project was never finished, Brian still produced his “making-of” book, as well as some really cool Rustboy vinyl toys (which make me want an Ellie vinyl toy so much. One that has a green light in her torso). I had heard that there was even a children’s book in the works (haven’t seen one yet though). I so loved Rustboy. It is the thing that made me want to make a film, the thing that made me make a comic in my spare time. I so hate that it sort of vanished. Big inspiration. “@monsterriot There’s an ongoing deal with one of the studios regarding Rustboy, so I’m not in a position discuss it here. Thanks for the update Carsten. I’ve seen his other artwork; it’s great stuff. I’ve even found some of the vinyl toys at a local shop. And I’m right there with you Og. I followed every update on his site and gobbled it up like it was candy the moment it was posted.